other International organizations have been accused of frustrating the Nigerian Army over its fight against terrorists in the country. A Coalition Civil Society Organisations on Human Rights and Conflict Resolution in Nigeria in its first quarter report released in Abuja on the ongoing war against insurgency in Nigeria noted that after undertaking review of the ongoing-war on terrorism by the Nigerian military observed that UNICEF and other international organizations have been frustrating the efforts of the army through series of blackmails. Presenting its report on Tuesday in Abuja, Gowon Maxwell Esq, Executive Director of the group affirmed that the reports of UNICEF and NGOs have the potential to present Nigeria as a country with a military that has no good reputation, which would in turn make the country ineligible for international support. Maxwell in the report recommended that the civil Police must wake up and own a critical part of the anti-terrorism operation by ensuring that it resumes its statutory duties in the areas where the military has successfully wound down its operation. 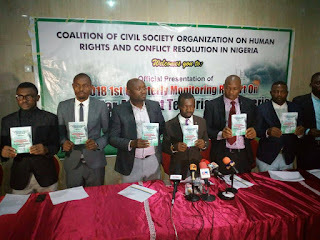 “The Coalition of CSOs on Human Rights and Conflict Resolution in Nigeria undertakes review of the ongoing-war on terrorism to ascertain maximum adherence of the military to the rules of engagement by the Nigerian military, enforcement of fundamental human rights of civilians and protection of man’s dignity and respect for person and to ensure that the activities of non-state actors are in conformity with the general principles and purposes of the United Nations and other conventions’ rights. The review period is based on the first quarter of 2018, which allows for the timeframe to be optimum – not too long and not too brief. “The review monitored troops closely in their operations to appraise their conduct, observance of rules of engagement and compliance with best international standard to ensure that human right remains sacrosanct. “Field staff and researchers from the coalition made up of seasoned academics and authorities with wealth of experience in internal armed conflict mitigation conducted on the spot visitations to theatre of troops' operations, IDPs camps and affected areas when it is safe to do so. In such instances, they interviewed survivors and eye witnesses. “The team also reviewed media reporting for contents about military operations and available internal and public documents of organizations and agencies that work in the affected area. “The review found that the Nigerian Military sustained its operation against Boko Haram terrorists in the affected areas, reducing the existence of the terrorists groups to restricted areas mostly outside the border of Nigeria. The operations continue to attract the interest of International Non-Governmental Organizations (NGOs) that make assessments based on their preconceived templates. “Such reports dwell on the desperate attempts by terrorists to use Improvised Explosive Devices (IEDs) or suicide bombs to sustain their scare tactics and continue to spread terror in the minds of the people. This is even as top commanders of the terrorists group have continued to turn themselves in to the Nigerian military. “The NGOs' position is capable of scandalizing the military to a point where the only option left is to withdraw troops from areas where they are operating, which would create an environment that would be conducive for a Boko Haram comeback to terrorize people in these places. An identified worrisome dimension is the seeming collaboration between these NGOs and top officials of the UNICEF, Priscilla Haveyda who are directly involved the execution of this agenda against the helpless people of Nigeria. “Authorities in Nigeria, especially the Federal Government, does not recognize these NGOs as threats, hence the freedom it allows them to operate with, which they abuse by deploying their international affiliation as tools to destabilize their host countries. “The continue participation of the military in the handling of terror suspects and rescue victims place troops in scenarios where they perform the duties of civil police and they often have to be collaborate at a deeper level. This has made it possible for the military to be accused of failings for purely civil policing matters. The figure of 1000 persons rescued from Boko Haram by the Nigerian Army was conservative as it was discovered that the Nigerian Army has rescued 2, 146 persons including children, aged women and men in the period under review. “The search for crude oil in the Lake Chad Basin has not been abandoned by the Nigerian National Petroleum Corporation even when Boko Haram has been deployed as an instrument of intimidation to abort the exercise. “The population should be conditioned to understand that civilians have roles to play in the war on terrorism. The military alone cannot accomplish the task of eradicating Boko Haram. The efforts of the civilian population would go a long way to prevent Boko Haram terrorists from successfully bombing soft targets.